Your home for everything Bunco! Welcome to My Bunco – Home of all things Bunco! MyBunco.com is your source for planning your next bunco Theme Party. Just a word of explanation, I started out designing invitations and announcements for parties and events. 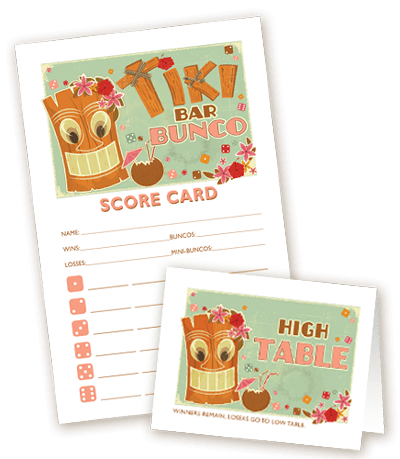 Someone contacted me and asked if I could design a score card and table marker set for their next Bunco Party. I said absolutely! That was several years ago and I have since built a library of great Bunco Theme Sets. Please take a look at the matching Bunco Theme Party Inspirations that match our Bunco Sets. Follow us on Facebook to receive the latest news, chances to win free bunco sets and more from MyBunco! Do you have an idea for a Bunco Theme Party? If you have a great idea for a custom Bunco Theme, just let us know! If we think it is a great idea, we will put together a custom set for no extra charge! Examples of custom requested bunco sets are our Peace, Love & Bunco Set and Cinco De Mayo Bunco. So Contact Us to let us know what you want your next Bunco Theme Party to be!